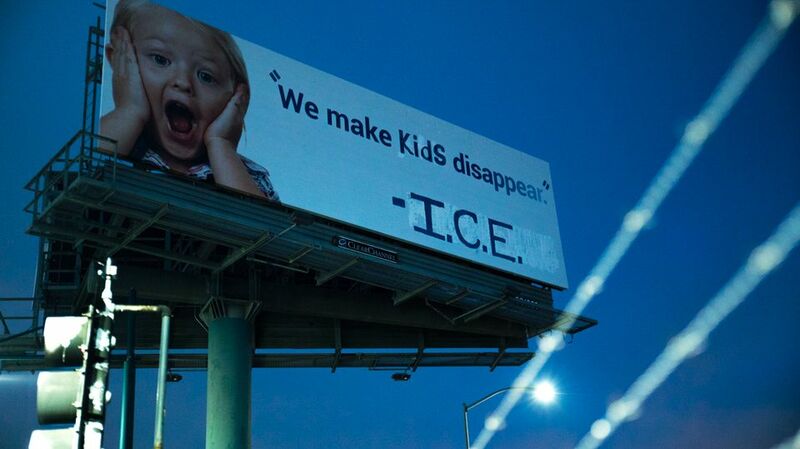 The activist artist collective Indecline responded to the immigration crisis in the US by doctoring the slogan of a billboard in Emeryville, California to read “We make kids disappear”, signed by the US department of Immigration and Customs Enforcement (ICE). The project comes in the wake of reports of immigrant children being separated from their families—perhaps permanently—and detained in meager holding facilities under the “zero tolerance policy” ordered by the US attorney general Jeff Sessions in April. “We spotted the billboard that evening and within a few hours procured materials and assembled a small team to climb there and change the message”, says a member of Indecline. The anonymous group worked overnight on 19 June to alter the billboard—originally an advertisement for a junk removal company—and made a video of the process. The next day, Donald Trump signed an executive order to reverse the family separation policy, although countless families remain separated and allegations of negligence and sexual abuse at children’s holding facilities continue to surface. Indecline has staged a series of anti-Trump projects since the 2016 presidential election, including the naked statues of Trump that appeared in five major cities in the US shortly ahead of the election, the Trump graveyard at the Trump National Golf Club in New Jersey and the Trump prison cell that was installed at the Trump International Hotel and Tower in New York earlier this year. The group has also tackled gun culture, recently altering a billboard in Las Vegas that advertised the deal “shoot a .50-caliber only $29” to “shoot a school kid only $29”. This latest impromptu project is a “direct response to President Trump’s xenophobia and dedication to inhuman and blatantly racist practices and policies surrounding immigration, specifically his willingness to inflict trauma on young children and families”, says the group.